Pfeiffera monacantha (Griseb.) P.V.Heath in Calyx 4(4): 158. 1994. = Rhipsalis monacantha Griseb. Abh. Konigl. Ges. Wiss. Gottingen 24: 140. 1879. Holotype: Argentina, Salta, San Andr6s (west of San Ramon de la Nueva) Oran, 25. Sep. 1873, Lorentz & Hieronymus 453 (GOET), isotype US 603291. 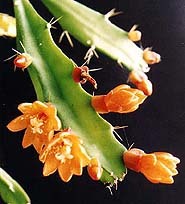 (Doweld) Ralf Bauer in Cactaceae Syst. Init. 19: 8. 2005. 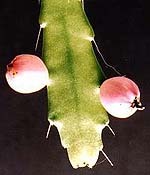 = Acanthorhipsalis monacantha subsp. kimnachii Doweld in Sukkulenty 4(1-2): 41. 2001- publ. 2002. Rhipsalis monacantha var. espinosa Kimnach in Cact. Succ. J. (Los Angeles) 67(1): 38. 1995. Holotype: Bolivia, dept. Cochabamba, road from Cochabamba-Chapare highway to Tablas, 1974, Aguilar s.n. in Kimnach 2757, cult. Huntington Bot. Gard. 51587 (HNT), isotypes: HEID, US. Seeds - . dark brown. DISTRIBUTION Bolivia (Cochabamba, Santa Cruz, Tarija), Argentina (Jujuy, Salta): at 300 - 2000 m altitude. Kimnach’s recently published description of a new variety espinosa [Cact. Succ. J (US) 67: 37 - 39 (1995)] has highlighted the diversity within this species, but the decision as to whether sub-species should be recognised must await further studies in the field.